Oil prices (WTI and Brent) didn’t do much last week: WTI inched down by 0.12%; Brent oil fell by 0.97%. As a result, the premium of Brent oil over WTI slightly expanded again; the premium ranged between $2.80 and $5.96. Based on the recent EIA weekly update, oil stockpiles decreased again by 2.8Mb. In the U.S, imports, production and refinery inputs declined during last week. Will oil resume its rally next week? This week, several reports may affect the oil market. These items include: China’s manufacturing PMI, U.S GDP, U.S core durable goods, and EIA oil weekly report. 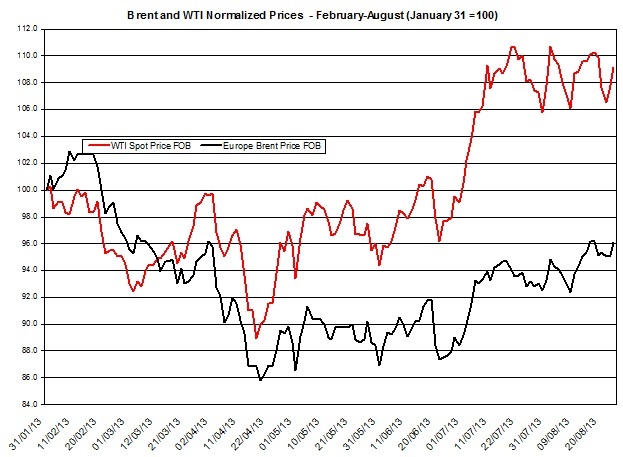 In the chart below are the changes in WTI and Brent oil prices in recent months (prices are normalized to January 31st). 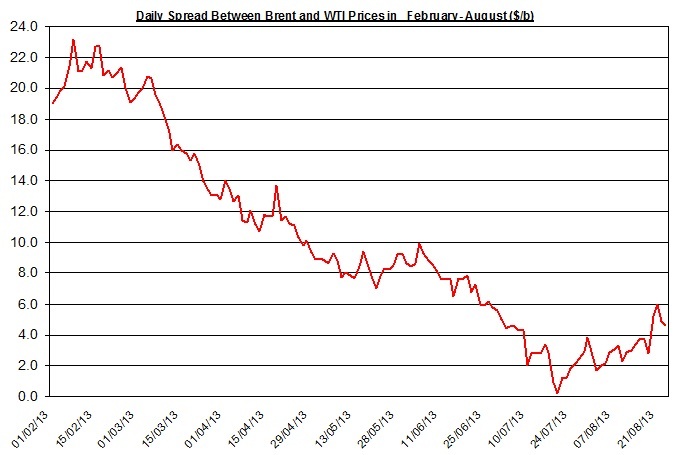 As seen in the chart herein, the oil slightly increased during the month. The gap between Brent and WTI oil rose last week as it ranged between $2.80 and $5.96 per barrel. Moreover, during the week, the premium grew by 73.03%. The oil stockpiles declined by 2.8 MB and reached 1,813.28 million barrels. The linear correlation between the changes in stockpiles has remained stable at -0.216: this correlation suggests that oil price, assuming all things equal, will increase next week. Oil imports to the U.S fell by 0.2% last week. The weekly changes in oil imports have a mid-strong negative correlation (-0.274) that implies oil price may rise next week. Moreover, oil production also fell; refinery inputs decreased by 0.3% last week. In total, the drop in production and imports might tighten the U.S oil market. The next weekly update will be published on Wednesday, August 29thand will pertain to the week ending on August 23rd. The ongoing turmoil in Egypt may keep oil price from falling. The main issue will keep revolving around the potential blockage of the Suez Canal, in which nearly 3.8 million barrels per day transport through it. Keep in mind, in 2011 Arab spring that also erupted in Egypt, the Suez Canal remained open. Friday – China Manufacturing PMI: Last month’s report regarding July 2013 the Manufacturing PMI increased to 50.3 – i.e. China’s manufacturing sectors is expanding at a slightly faster pace; in the latest flash PMI report, the index rose to above the 50 point market. If in the upcoming report the PMI will keep rising, it could signal growth in China’s economic development. If the index will rise, this may positively affect leading commodities prices. From the supply standpoint, the decline in production, imports and refinery inputs could pressure up oil price. The U.S oil storage declined again; this serves as an indication for the decline in supply or an increase in demand; this, in turn, may suggest the U.S oil market has slightly tightened again. 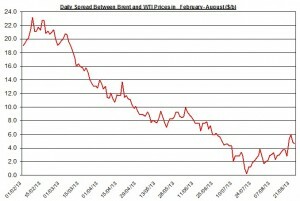 The ongoing turmoil in the Middle East mainly in Egypt could keep the price of oil from further declining. From the demand side, the upcoming reports including U.S GDP, core durable goods and China’s manufacturing PMI could signal the potential growth in demand for oil in U.S and China. If these reports will positively surprise the current market expectations, they could positively affect the price of oil. 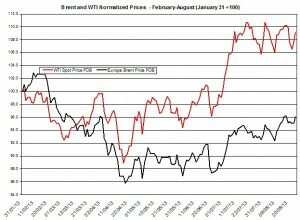 Finally, despite the slight increase in the premium of Brent over WTI, it is likely to remain around $5. The bottom line, on a weekly scale I guess oil price might remain at its current level and won’t change during the week.